Many, many thanks to friends, Kerry and Marion Manson, for hosting a really fun evening where we could relax, meet new friends, enjoy some wonderful treats (like pavlova! ), and “Show and Tell”. 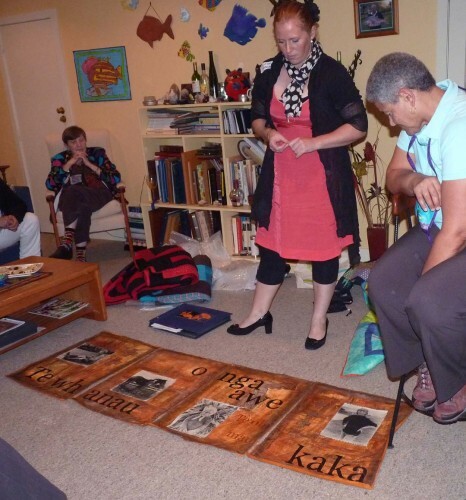 Here, Katherine Parrott Reeves, shows off her quilt Te whanau o nga awe kaka. 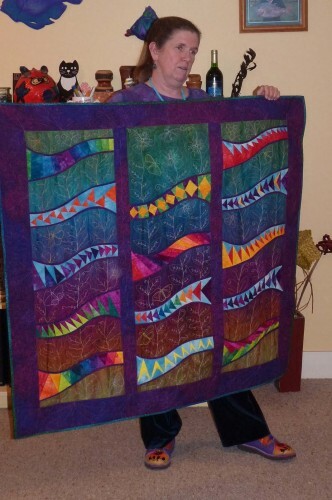 Translated as the “Red feathered parrot family, this quilt describes her family and heritage. The images in the quilt are of Katherine and her 3 brothers. This quilt is featured in the 2009 exhibit and book “Made in New Zealand II”, organized and published by Anne Scott, owner of New Zealand Quilter magazine and Minerva, located in Wellington. Here, Robb Jerebine shows off her plaid creation. The image doesn’t really do justice to this charming quilt. 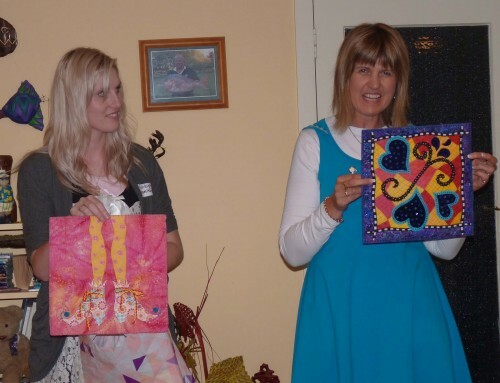 Donna Ward, and daughter Ashleigh, show off quilts from a miniature challenge in which they participated. 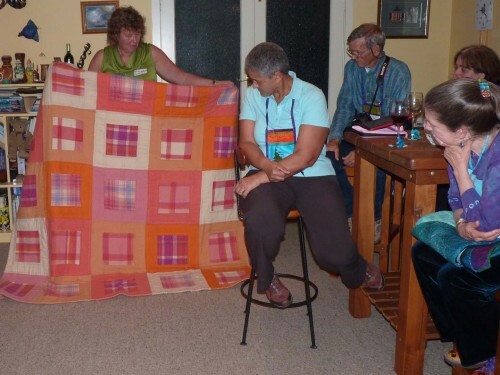 Donna, Ashleigh and mom, Merle, all taught at the Remarkables Symposium in Queenstown, three generations of quilting teachers! 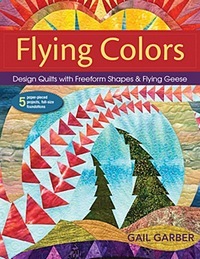 I showed off my Flying Colors Sampler, one of two quilts that were small enough for me to carry along on this trip. Meet “Not Bruce” and “Not Robert”. Seems that when we made the nametags for the group, we used everyone’s given names as they were listed on their passports. 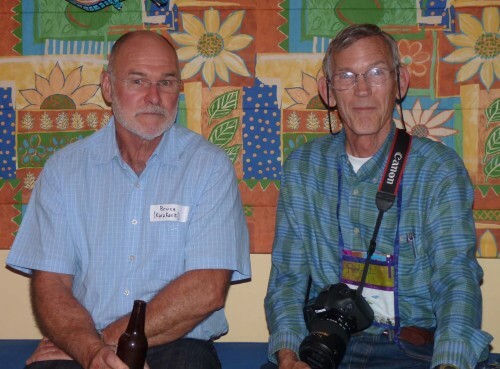 It was after a little beverage indulgence at the party that our mistake became apparent! Not Robert is really “Mike”, a New Mexico resident. “Not Bruce” is a friend of the Manson’s and husband to Robb.